A square of shingles is a standardized measurement used by contractors that applies to shingles of any size based on their ability to cover a certain area of roof. Shingles are the building block of many roof styles, as contractors attach them to plywood sheathing to protect the roof from the elements. A square is the number of shingles it would take to cover 100 square feet of roof area with each row of shingles covering the tabs of the layer below it. 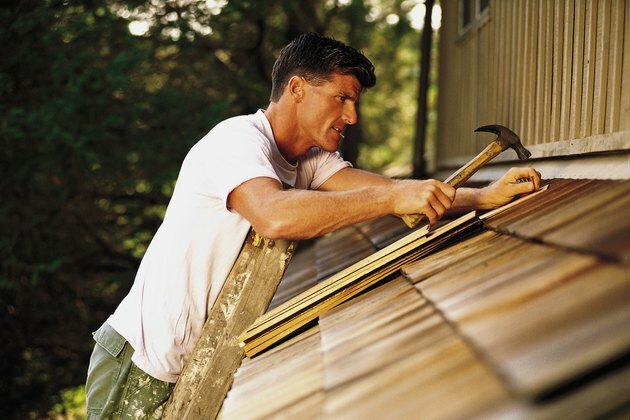 Shingles are packaged in bundles that include a number of strips of roofing. Twenty-seven strips equal a bundle, generally speaking, and roughly three to four compose a square. Since a square of shingles must cover the same amount of area, more shingles would be necessary if they were of a smaller size, and vice versa. While a square is a square, the number of bundles it takes to have a square of shingles is dependent on the size of the shingles used and the construction of tabs to attach to the sheathing. Francis Matthews currently write SEO-friendly news articles for websites with topics as varied as military lodging, health supplements, car dealers and health insurance finders. Matthews has worked in corporate communications and as a reporter at a newspaper tasked with late-breaking news stories. He has a Bachelor of Arts in history and Spanish from Eckerd College. How Many Square Feet in a Bundle of Shingles?